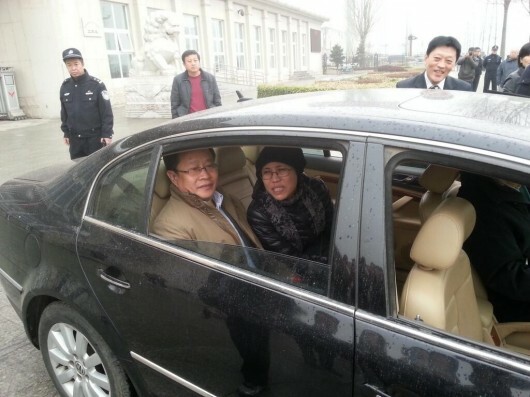 The wife of jailed Nobel Peace Prize winner Liu Xiaobo was seen in public for the first time in more than two and a half years today as she attended the trial of her brother, 43-year-old Liu Hui, who has been charged with fraud. Liu Xia shouted: “I’m not free – tell everybody I’m not free,” as she glimpsed the crowd outside the courthouse in Huairou, a diplomat said. She added: “I love you – I miss you,” before she was escorted away. Liu Xia was interviewed in December by AP reporters, and a few weeks later met with activists who pushed past security guards. Last month, another attempt to approach Liu Xia’s apartment, by two Hong Kong journalists, was not as successful. Her brother is surely being railroaded. We all know how the Party works. How is that promise of the rule of law working out? Badly? Non-existent? A complete joke?